Two or three warm days make it feel like spring is here. The grass is noticeably greening up. Even here in southeast Texas, where the temps normally come back up after a few cold days of cold, we’ve had a long winter of bundling-up. I know our mostly in-the-50s days and down-in-the-30s nights are not that bad compared to those in some other parts of the country. I spent a good many years lasting through cold Kansas winters, so I can appreciate not having to scrape windshields and scoop off driveways these days. 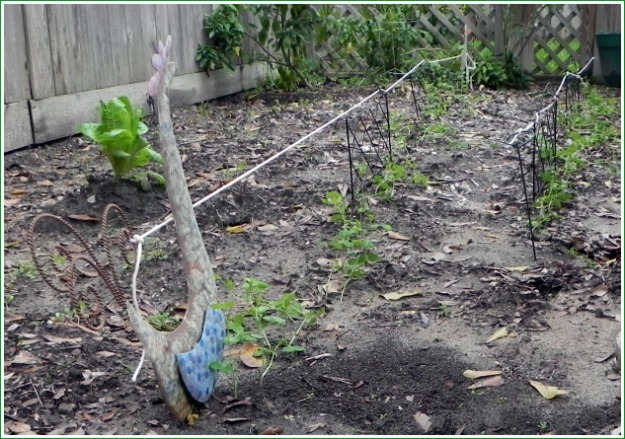 The below 30s and accompanying freezing rain and sleet we did have on a couple of occasions have interfered very little with the veggies that I planted at the end October out in the small garden behind the garage. The perky leaves of the mix of greens and the glistening tops of the carrots and turnips seem to be almost showing off here in the middle of February. The carrots and the traditional purple top turnips probably won’t make for some time, but this next weekend I intend to cut a batch of the greens for a wilted salad. 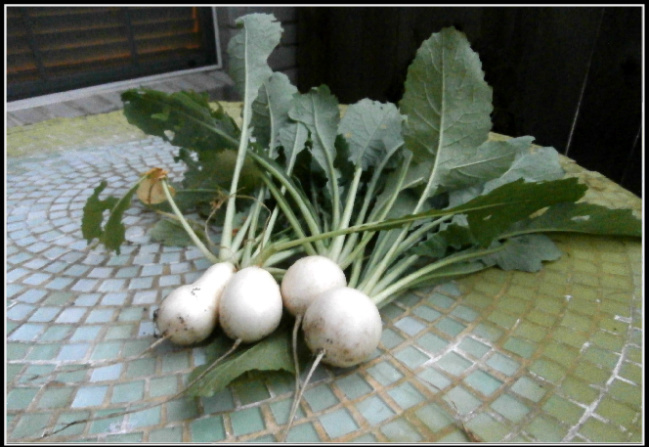 This evening, though, I couldn’t resist pulling up four of the Hakurei turnips. Right now, some are about the size of a big radish. They are sweet and crunchy with just a little bite, as I verified by munching them down once they were washed and the tops nipped off. I get most of my seeds on line from Johnny’s Seeds. 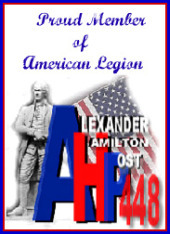 I don’t mind giving them a plug because I’ve gotten the seeds very quickly and the packs are a lot fuller than those you get at the big box stores. I’m eating a lot of store-bought veggies these days, but it’s sure fun to have a bit of the home-grown taste of these turnips. The garden space behind the garage is a mini-jungle. 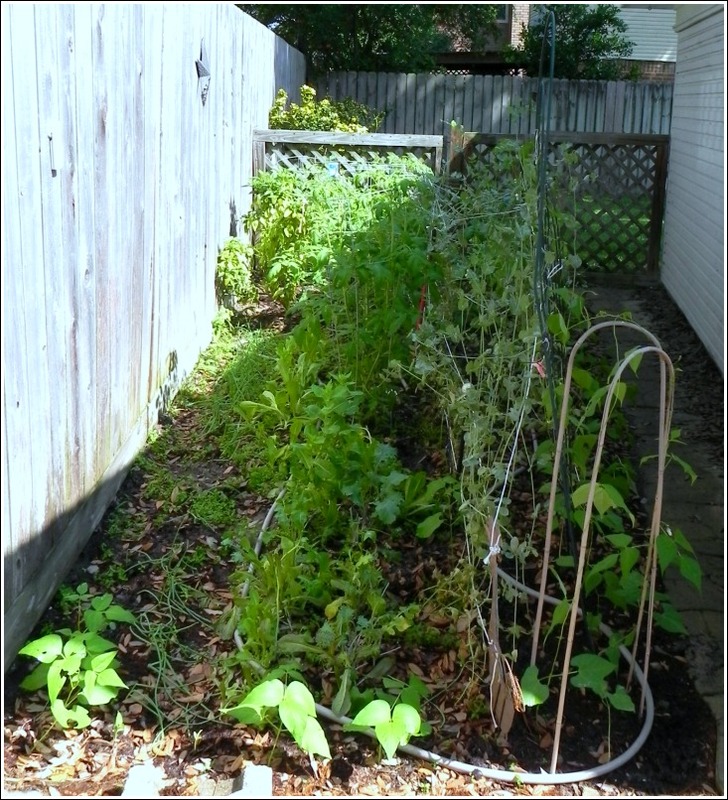 The peas have already hit their peak, but the tomatoes and beans stretch higher every day. I'm getting enough lettuce for a salad every day, pulling up a tender scallion to go along with it. What a beautiful, lazy Sunday morning. After getting up at 5:30 to let Annie out for a quick go, I crawled back under the covers for another few hours of dreamy–weird dreamy–dozing. When I could no longer bear the crazy slumber, I pulled enough clothes on to go out to the backyard, but not before grinding a few coffee beans and setting them to brew. Not being a “churchy” person, I then began my leisurely Easter morning puttering, repotting a couple of under-tended plants, squeezing in a few more wax bean and okra seeds in the already jungle-like garden, tying up the drooping passion flower stems to steady pergula posts, weeding out any ever-present chickweed and elm sprouts that I could reach, then finally giving everything a good dose of watering before the sun’s cheery Sunday rays would obliterate the remaining protective shadows. Now it’s time for a good shower and then off to see if I can find a few groceries. I doubt much will be open out here in conservative suburbialandia. I don’t need to buy much, just wasn’t in the mood to do the shopping yesterday. I will have to remember not to take the street out of the sub-division that enters onto the road that passes the Catholic church. They’ll be swarming into that place like those ants that were trying to make a new hill next to the patio. Ortho took care of that. 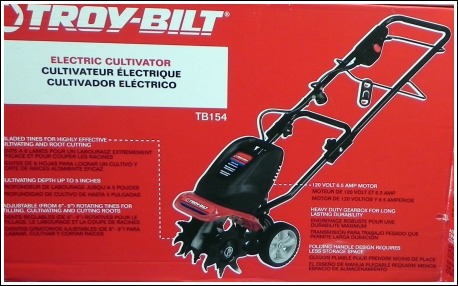 I hope you will enjoy this visual taste of my yard and garden. 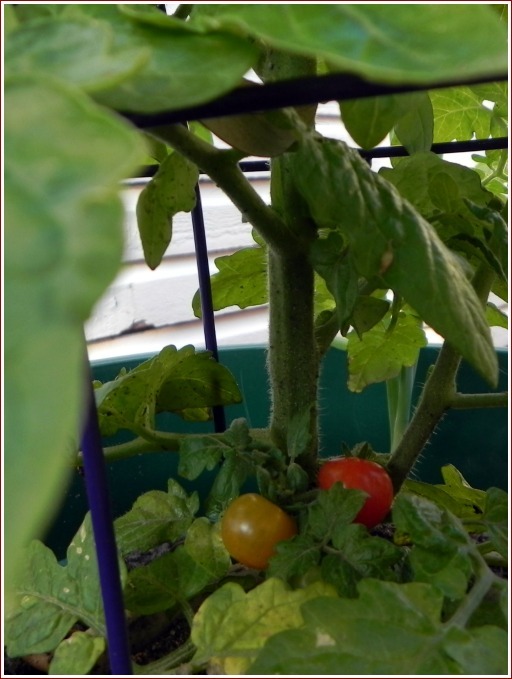 This cherry tomato plant growing in a container is loaded with clusters of the small fruit. 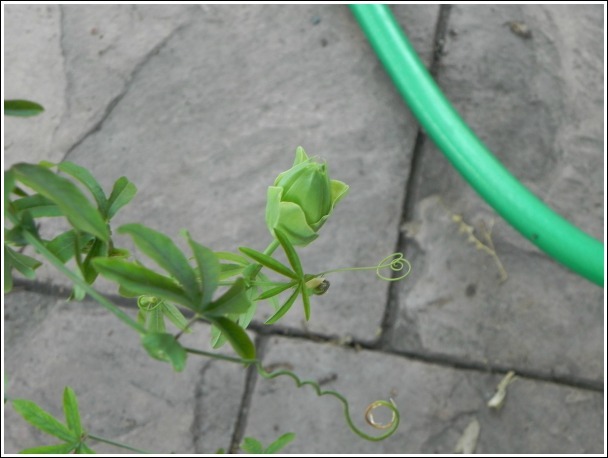 A bud has appeared on this passion flower plant, not so many weeks after I brought it home from the nursery. 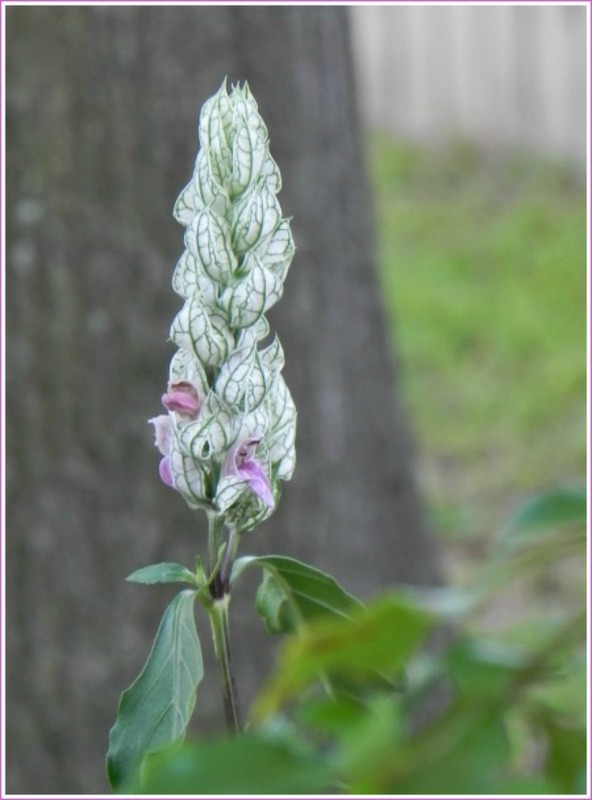 I now know this is a white shrimp plant bloom, of which each little pod slips out a lavendar tongue as it opens. 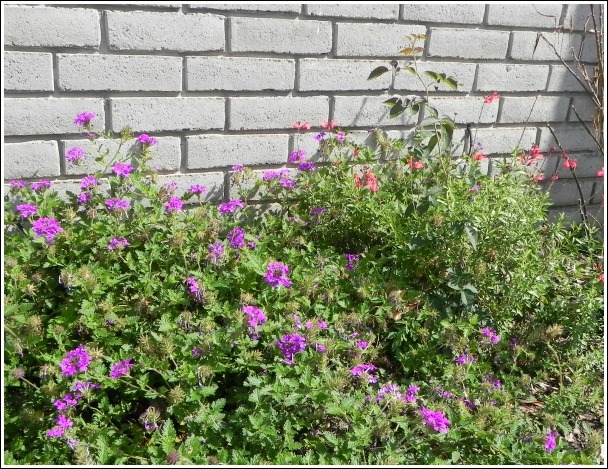 This verbena brings a blanket of color to the sun-drenched bed on the south side of the house. 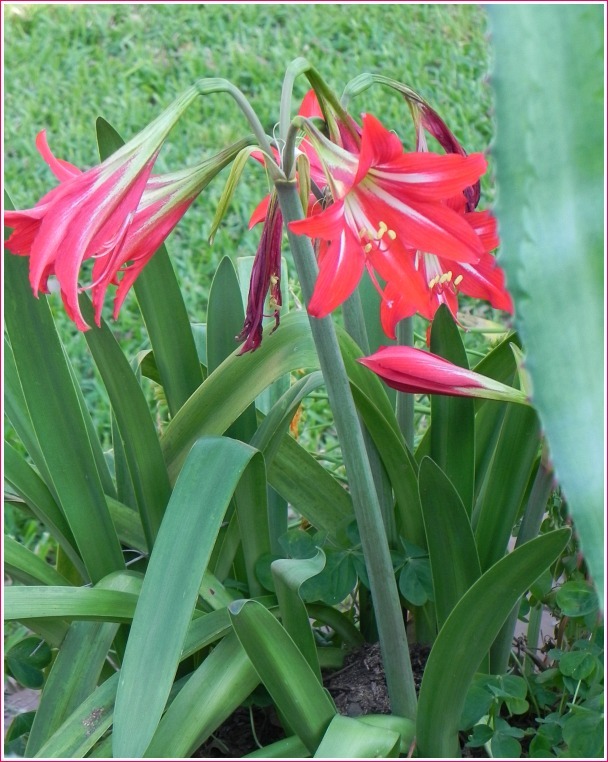 This hand-me-down amarylis so invariably blooms at Easter, no matter when it falls on the calendar, that I have always called it an Easter lily. 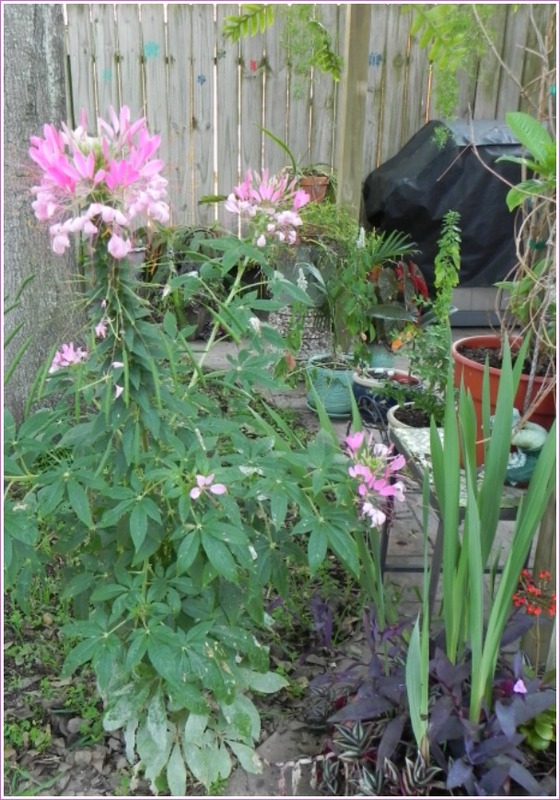 This cleome brightens the edge of the patio. 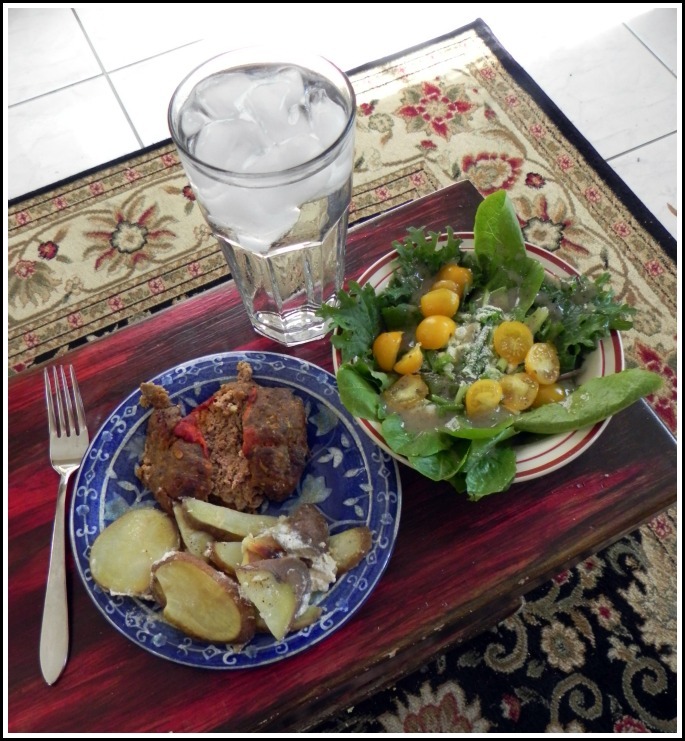 Homemade meatloaf, scalloped potatoes, and a salad with lettuce, arugula, and green onion straight from the garden. Can you beat this for Sunday lunch? 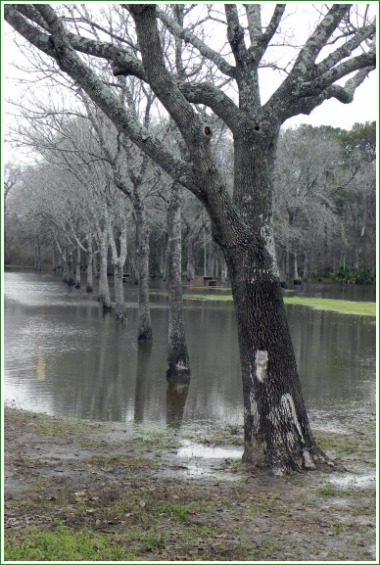 Today is one of those nearly perfect days that we get here in southeast Texas, usually in early spring. The blue sky is filled with puffy clouds that keep the temperature mild as they intersperse shade onto the St. Augustine grass of the back yard. With all the good rains we’ve had, the vegetable garden, the flowers in the pots and beds, and lawn are all trying their hardest to grow, even though the chickweed is fighting to outdo them. After attempting to thwart some of the chickweed’s successes, I came back into the house and put together one of those old Sunday favorite meals: meatloaf and scalloped potatoes. I should have invited someone to share it all with, but I hadn’t thought far enough in advance to do that. When it was time to eat, I went back to the garden and cut some lettuce, arugula, and a green onion to go into a salad. I’ll make lunches to take to work with all the leftover meatloaf and potatoes; Marie Callender would be jealous. 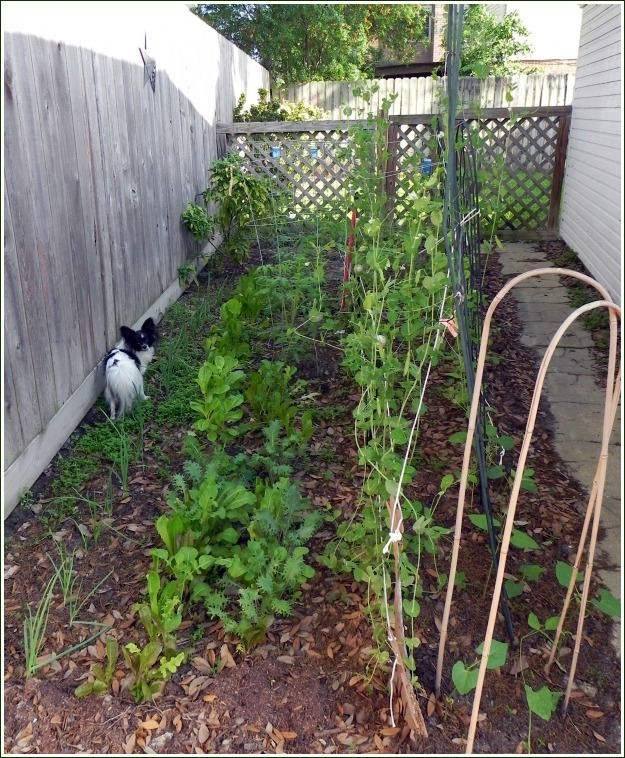 Peas, lettuce, arugula, green onion, pole beans fill this end of my little garden behind the garage. At the other end are about 10 tomato plants and a holdover from last year, a hot Italian pepper. On the sunny side of the garage I have four more tomatoes in containers. The dog is not planted, but does like to be in photos. 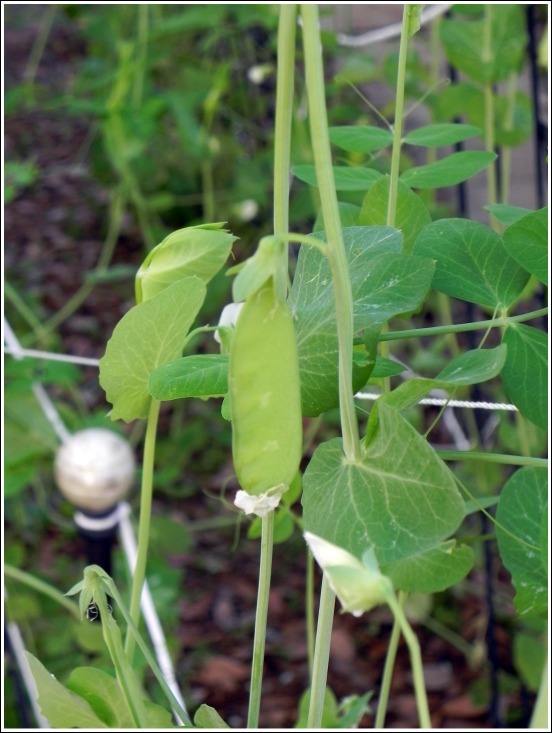 The peas that I planted in mid-January are just starting to produce. 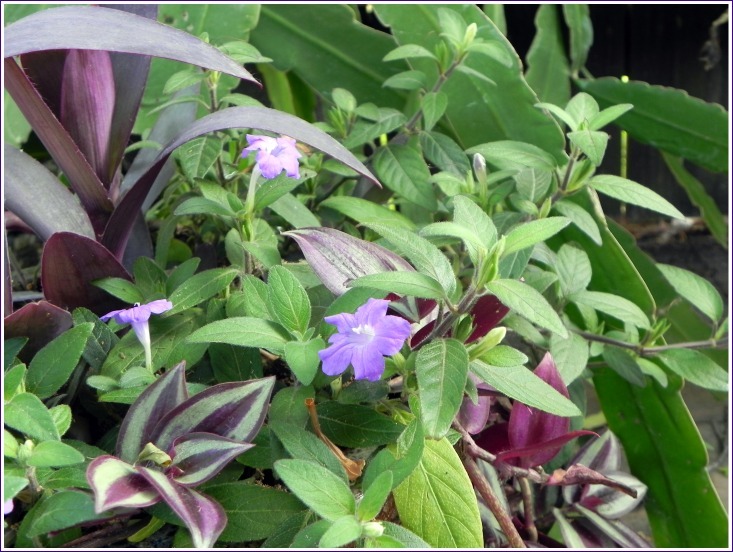 This ruellia and wandering jew require little care but add a lot of color to a corner of the patio. 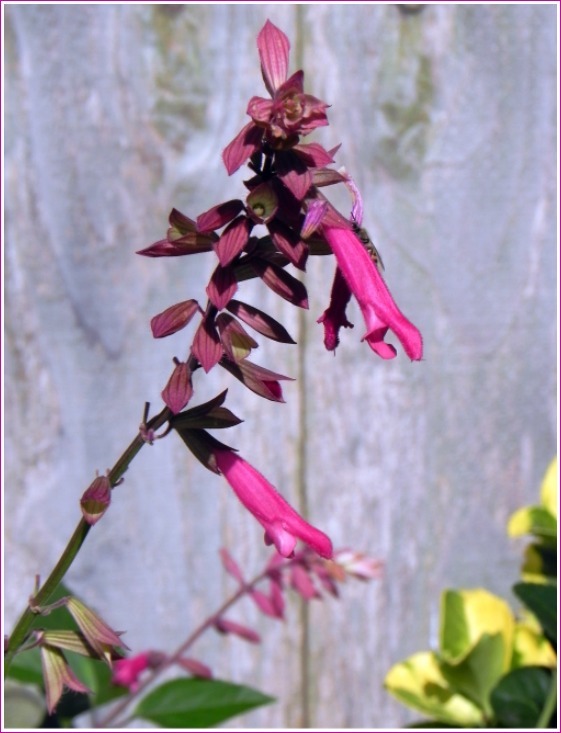 My lack of patience is to blame for there not being a buzzing honey bee looking for nectar in this blossom of a large salvia that I planted last year and which withstood the drought. 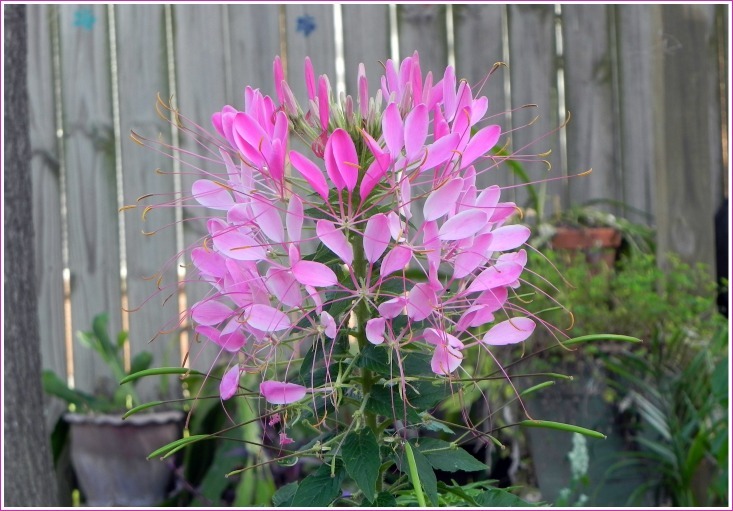 This burst of color comes from a cleome that seeded itself right at the edge of the patio. 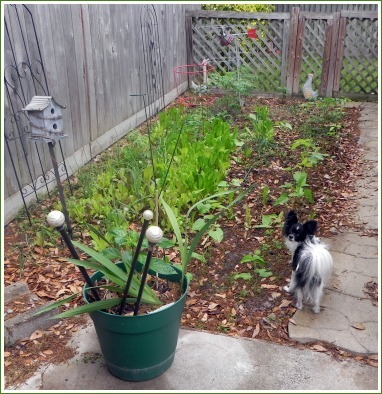 When it becomes garden time, this blog could be one of the most boring in all of the blogosphere; however, my little patch helps keep me on an even keel, so I like to add a pic here and there just as a record for myself of what I planted when and how things are growing. It’s just been about 2 weeks since I put in the last photo, but the entire plot looks so much greener. The lettuce is still going gangbusters, and most of the beans have started on their second set of leaves. I didn’t over-plant this year, so I’ve had to go back and drop in a seed or two in places where the originals didn’t sprout. I have a total of 7 tomato plants and 4 sweet peppers, not counting the 1 volunteer tomato that I discovered a couple days ago; it probably came from the compost that I added last winter. I need to get in and hoe out the chickweed and elm tree sprouts that would cover the ground if it weren’t for the vegetable plants; however, unfortunately–or fortunately–we have had enough odd showers to keep the garden soil a bit too moist for that task. The neighbors across the street are having a garage sale, which they started preparing for before 6 AM. Of course, Annie couldn’t stay settled with the commotion, so we’ve been up since that time; quite early to get up on a Saturday, but I’ve gotten the back patio swept of most of the remaining oak leaves and the nasty pollen crap that they put out in the spring. 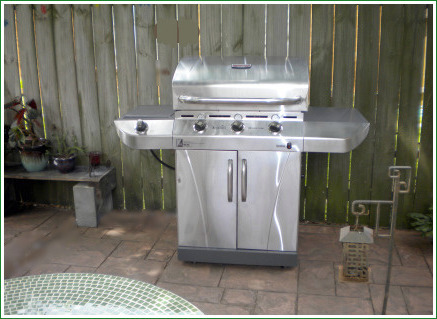 I love my shady oak tree, but keeping the patio clean is an almost never-ending story. Oh well, just like my garden, the patio with its shade-covered pergola is one of my favorite parts of my house. OK, yes, it’s Saturday, and now 10 AM; it’s time for a shower and out to take care of any number of errands. 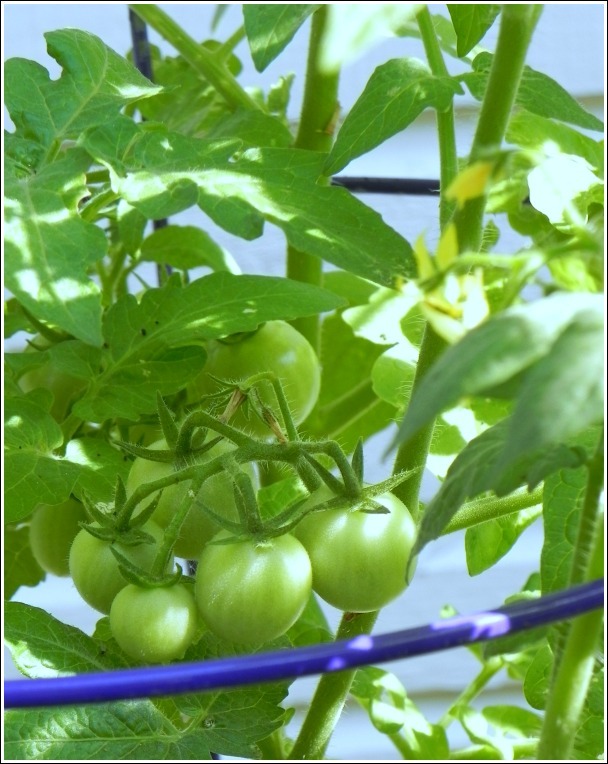 Tomatoe cages, for one. Definitely need more tomato cages.